On our second day in Salvador we woke up early and right after a nice breakfast headed to Itaparica, an island about 10 miles from the Bahian capital. The location is famous for its very clean beaches and also for the handful of resorts that exist there. 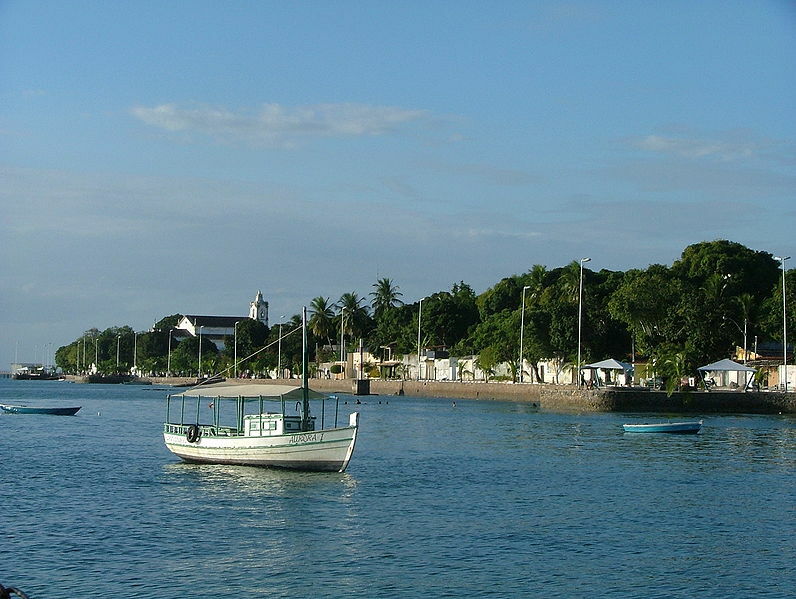 The village of Itaparica is home to about 55,000 people, many of whom are fishermen. The only way to get to the island is by taking a ferry boat that departs from the port of Salvador, about a 10-minute cab ride from our hotel in the historical district. I commented with Renata that we seem to be unable to live without that kind of transportation – we live on Staten Island and use the service here, and we also often ride ferries to places like Fire Island. Each ride costs R$ 4.50 (about $1.25 as of this writing) and it takes about an hour to get there. The ride is very slow but quite scenic – you get great views of the city and the sea, and there is a snack bar that sells pastries, soft drinks and beer. There also authorized vendors selling everything from fresh fruit to local souvenirs. Upon arrival we took a cab to the main beach, and the driver dropped us off at Mike’s, one of the few beachfront restaurants open then since this was low season and heavy rains that plagued the area had discouraged tourists from visiting. At the place there were only a couple of tables occupied – something that had not changed for the whole time we were there. The beach didn’t seem very clean because the rain had washed leaves, twigs and other things onto the shores, but that was clearly not pollution – it was just a consequence of the season. The water, however, was crystal clear and warm. We sat with a drink for a while and later ordered the traditional moqueca (Brazilian fish stew), Bahia’s signature dish. We were given various choices of fresh fish, mixed seafood or shrimp, and we settled with the fish. The fish – cooked in a clay pot – was served with sides of rice, farofa, pirao (a sort of gravy made with yucca flour and the cooking sauce) and hot pepper sauce. It was really delicious and filling – one of the best ever. As we ate, a stray cat walked up to us and gave us the “needy” look, so we gave him the fish’s head since none of us was interested in it. He ate quickly and stayed around us for a while. After the meal, we settled the check, went for a walk to the beach and returned to the ferry about an hour before sundown. After a shower and a light dinner we met with two of my cousins and headed to the now-trendy neighborhood of Praia da Barra. The area recently received an overhaul that included an expansion of the sidewalks and a car-free walk right by the beach. We took a few photos and then headed to Pereira, a high-end restaurant where we sat for drinks and talked – I hadn’t met that side of my family for over a decade, so there was a lot to talk about. Luckily both of them spoke English so I didn’t have to do any interpreting for Renata. Brazilians are mostly beer drinkers (which suits the climate of the region), but I decided to have some red wine – bad idea, since the wine was served just below room temperature and it was definitely not a refreshing experience. The next morning we walked back to Pelourinho and paid a visit to the Jorge Amado House Foundation, which is home to two exhibits on the life and works of Amado and his also-prolific wife Zelia Gattai. On the top floor we see a chronology of his work from the 1920s, the many adaptations of his work to the cinema and TV and some memorabilia, including his typewriter, some of his other possessions, movie posters, different translated versions of his books and both the uniforms he and Gattai wore as members of the Brazilian Academy of Letters (she took his chair after he passed in 2001). There are also multi-language touch screens with information on his works. The bottom floor tells the story of Amado and Gattai’s long marriage, photos of their children and also her own literary canon. The walls also display where each of their books were published, including Portugal, Poland, Russia, Germany and the United States. As we left the historical district we made a quick stop at the Memorial of the Baianas do Acarajé, a small hall dedicated to the baianas who make acaraje. The room shows the entire process of making the acarajé from mashing the beans all the way to the final product, and the history of the baianas who make them. After leaving the museum we headed over to the Lacerda Elevator, which connects the higher and lower parts of downtown Salvador (the city has hills everywhere and it was built around and over them). 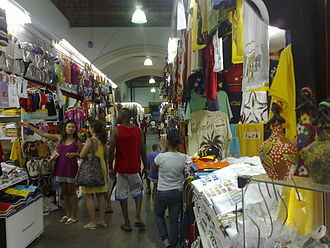 The ride has the symbolic charge of R$ 0.15 (about a nickel) but it is pretty ordinary – nothing panoramic or anything since it is not really a tourist attraction – just a way for people to get around and once in the lower part headed to Mercado Modelo, the city’s main destination for artisanal goods. It is a place where you can freely negotiate prices with the vendors. We bought a few gifts for friends back home and some souvenirs and when we got hungry we found an inexpensive salad bar nearby after we realized that the two restaurants inside were nothing but overpriced tourist traps. 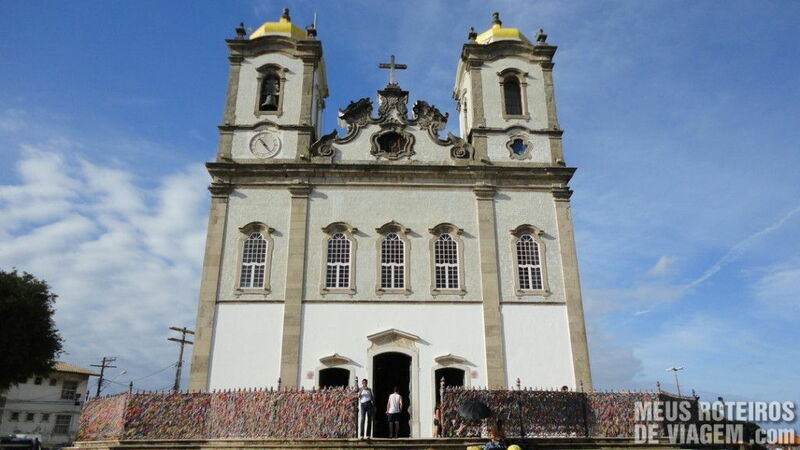 Our next stop was the Sanctuary of Nosso Senhor do Bomfim, arguably the most famous church in the entire state. Built in 1772, it is on top of a hill in the neighborhood that ultimately took its name. 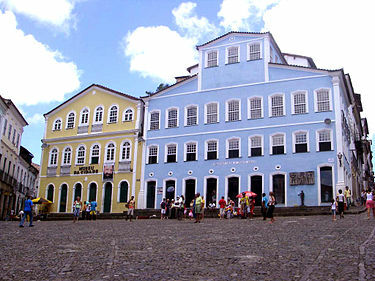 It is a beautiful baroque church and is also the location of one of the most revered religious festivities in the city, The Feast of Bomfim. While we were there we met two Polish tourists – one of whom was a history teacher who wanted to see the famed “azulejos” (tiles) on the sides of the temple. When we returned to our hotel the bakery where we’d been purchasing sandwiches was already closed, so we headed downhill for a bar where they’d been making inexpensive chicken and sausage kebabs. Once satisfied, we visited Oliveira’s House Bar right across the street from the hotel where we were told there’d be some jazz. Sure enough, there was a trumpet and guitar duo playing a mix of Brazilian and American jazz standards (“Corcovado” and “Take 5” were among the tunes they did). They were very good, and during the break they invited musicians who were there to sit in. I could not resist, and took my ukulele and did Harry Belafonte’s “Jamaica Farewell” with them. They seemed to have appreciated my playing, because they invited me to continue and improvise on a blues piece. Thankfully, Renata captured it all on camera and I uploaded it to YouTube. On our final day before heading to Fortaleza, we returned to Praia da Barra and visited the Nautical Museum inside the lighthouse. There we saw the history of the early navigational journeys to Brazil, replicas of various generations of ships and also the some artifacts from the lighthouse’s military past. We then walked around the beach for a while and stopped for lunch at a small restaurant called Boteco do Farol where we ate a light lunch of chicken “a passarinho” (cut in bite-size pieces served with salad and farofa). As the afternoon wound down, we went back to our hotel and packed our bags – it was time to leave Bahia and head to the second leg of our trip in Northeastern Brazil.